Amongst all the other features of the current game of the moment Call Of Duty : Black Ops II there are some great tools for exploring replays. Every game that you play is stored away on servers somewhere. In game you can pull one of those games as a replay. In the replay you have full control over the camera views, and can zoom back an forward through time. This replay is a reconstruction from the player data, so it needs the game to be able to see it (or anyone else’s shared replays). It does however allow you to render the replay to an actual movie and put it on youtube. Of course just a first person or 3rd person view of the game might get a bit samey, so hidden away is the ability to set camera positions and have cameras follow a virtual dolly to let us budding action movie directors create this sort of thing. The Elite web side used to be a subscription only extra add on, but is now open to everyone, this lets you explore the data in more ways. 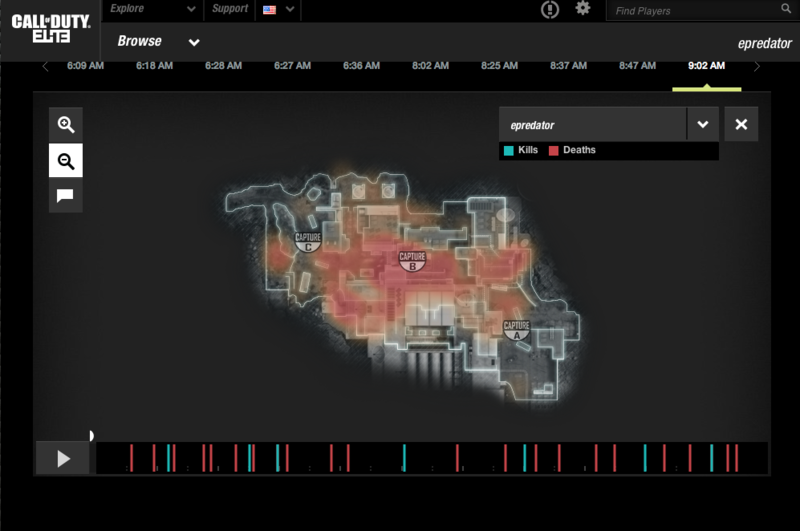 Things like the heatmap view of a level that shows a map view of where things happened and when. With the ability to drill down into the data and see what happened where. Of course this is not for everyone but it is interesting as it gives an insight into what gets captured and stored. Whilst it is just player positions and status over time, that is used to reconstruct the visuals it is a huge amount of data, given the millions of games that have happened already. As you can see in this example I tend to die more than anything else 🙂 It is still great fun though. Ok so it’s a dramatic title, but it is not about any 2012 apocalypse of the breakdown of our social structures because of the greedy few absorbing all the money in the world. 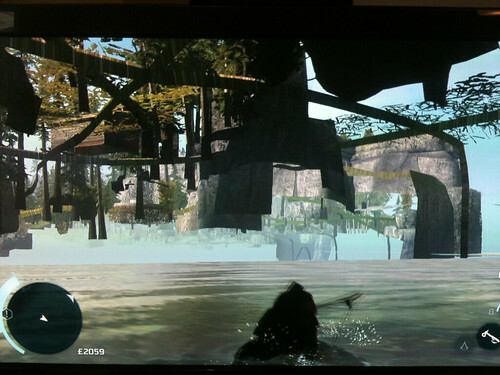 No this is just an observation I got to make on the current incarnation of Assassins Creed, number III in the series. The game is certainly a mammoth production, I have definitely enjoyed exploring the environment, as you should with a free roaming environment. Of course this means hitting the edges of the world. Quite often this is a message that an area is not yet available. 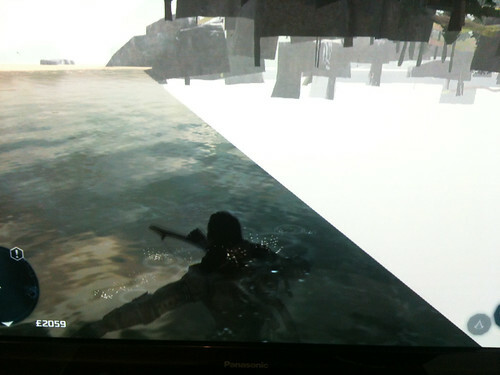 However I was a little surprised when I leapt to climb one particular cliff and fell right through it. The great thing about rendering engines is that they obviously have no idea if something is right or wrong. If the collision constraints fail you can end up in some very unusual places. I ended up in an ocean, but is clearly ended where the wall I feel through was. With the occlusion rendering backwards it looks like you can see the paths in the trees that are normally branches you leap to and from. The water simulation was still running, but had a spooky drop off. The world was flat indeed and I had fallen off. 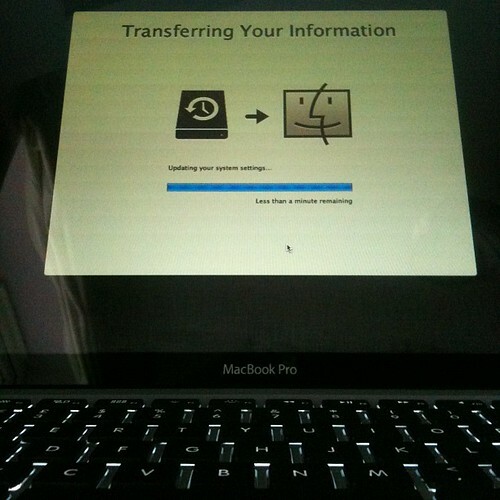 After nearly 4 years of faithful service my first Macbook Pro seemed to be getting very slow and very full. It was the machine that I bought on Day 1 of Feeding Edge and it has been to some very interesting places. Not least it sports the Cool Stuff Collective logo as we had to cover up the Apple logo for the TV show. I have replaced it was another 15″ MBP but not the retina display. They are lovely but it seemed a lot more money for a screen. I ended up with the 2.6Ghz Quad Core, 8Mb RAM and a 720gb Hard drive, plus the dual gfx cards of the intel 4000 and for real performance the nvidia GT 650M 1GB. It is the first time I have swapped a machine and then migrated. All the previous machines back in the corporate world the transferring of applications was a tiresome job usually involving reinstalling things on windows. I had a Carbon Copy clone ready just in case but I used my incremental backup with the very useful TimeMachine and set up the new machine to be pretty much like the old machine 🙂 This continuity feels like a refurbishment of a much cherished machine rather than a replacement. It’s like the old machine has found new life from somewhere. There have been the odd thing that needs its licence renewing or signing in again but its been a very simple, very user friendly experience so far. Next is to flatten the old machines OS and data and make it a vanilla Macbook Pro again so that the predlets can have their own machine too. That looks nice and straight forward as a recovery option just Cmd R on startup. I really was dreading moving machines, I held off for a year at least because I couldn’t face the hassle. Now I know it is easy and it just works, like most Apple things, then who knows this may get to be a bit more regular. I do try and get kit at the top end so that it does not make itself too obsolete too soon. Mac’s are expensive compared to a windows laptop but for years windows and the machines around it have given me nothing but trouble. The past 4 years has been almost perfect and seamless in the way I get to just do what I need to do. Well done Apple. 🙂 Hello old friend in a new body. Curiosity – Killed the cat? Curiosity went live on the smartphones a few days ago. 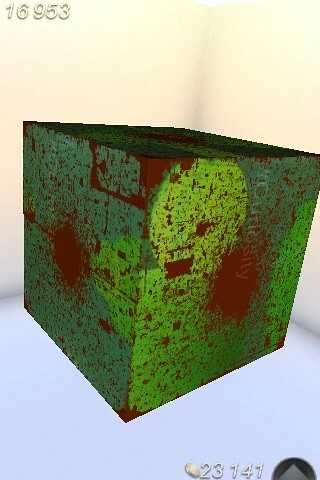 It is a well named free app/game/art installation/research project from Peter Molyneux’s new company 22Cans. The company name refers to the 22 gaming experiments that they intend to create. I was intrigued as to what the team was going to come up with and how they would strip things right down to gaming basics but apply it to the dynamics of the devices and of social media. Being an entitled an experiment is also good because it does not set the expectation that anything will work or not, merely that it is worth a try. Curiosity is basically a giant cube, a shared cube, a cube that each client sees in the same way. The cube is covered with millions of smaller pixel like cubes. Each player can zoom into the cube surface and tap a piece of the surface to chip it away. Underneath is another layer of the cube surface. Everyone has to join in to remove an entire multimillion piece surface with their own efforts to collaboratively clear the level and be able to start on the next one. In a giant social networked version of pass the parcel there is a secret final layer at the centre of the cube, hence the title Curiosity. There is to be one and only one winner of the information in the cube, the person to click the last ever surface cubelet on the last layer. Each layer on teh way down is a different texture and coloured picture. The first layer from Day 1 was black and shiny but was soon replaced with a green blobby type of laval lamp picture. The basic game mechanic of tapping away with your finger tips for ages and ages, emptying areas or randomly dotting around is certainly not the most taxing game idea. It does though have the pure elements of gaming grind that you find in any RPG and in particular in MMO’s. The visuals are of course basic, a textured cube covered in deliberately wonky tiled cubelets, which you only appreciate close in. The game lets you play completely anonymously with your fellow tappers, or you hook to Facebook for the usual friend spamming and tracking. Each tap produces a score in the shape of coins. These coins can be amassed to use special tools like bombs to remove the surface more quickly. Save up enough and you get a range of chisels. So all in all this seems almost completely pointless as a game, it does appeal to a certain compulsion to join in, not so much to expect to be the last person discovering the end point but to see why it is worth bothering at all. This is an intriguing introspection on Curiosity, as I am curious as to how the experiment is going and peoples motivations to try it. This is where it is very interesting as to what 22Cans are going to find out. No doubt lots of people will try it, like any free game and have a little go. They only have to tap one cubelet away, if enough people do that the cube with be cleared. The number of layers of the cube is obviously just data, so 22Cans can do what they want, unlike pass the parcel this is not a static wrapping. How people try and maximize their scores is interesting too. A bonus multiplier builds up as long as you are tapping and clearing at a regular rate, stop and its reset, miss and its reset. So zooming in with precision to get a large enough view of the cubelets for fingers not to miss and systemically clearing a screen offers one type of reward, zooming out and fast random scattering an area also works. I am assuming that the context and usage of each player is the sort of data being collected. I have often pointed out that many games companies do not understand true high volume sites, with the exception of the big MMO guys. The focus on 3 player shards in games is not prepared for the massive influx of small packets of information from hundreds of thousands of people at a time. The launch of Curiosity will certain level up some sys admins. The initial experience was one of the servers being all over the place. It’s free and it’s an experiment remember, so no one should be up in arms at this. You can of course theorise as to the depth of experiment that this actually is. The fact I am bothering to write about it, to have even downloaded it may itself form a small part of some massive data gathering. The cube has the #curiosity hashtag and other text messages floating across its surface so engagement outside of the game is certainly being explored. So get tapping, even if it is just to say how pointless it all is. Of course not tapping or bothering will be valuable data too. Yikes I am wrapping myself in a knot! I spent 6 hours the other night playing the news Assassins Creed III game. There is of course much more to do but I thought I would share a little of the experience, whilst trying not to produce any spoilers. The original Assassins Creed was something that looked like a great leap forward (no pun intended on the fact it is free running across rooftops) with some stunning animation, huge backdrops and crowds of people wandering around to add to the atmosphere. I remember it particularly at the time as there were a few colleagues in my corporate world who had not come across games of this type before and who were also coming to terms with virtual worlds. Our virtual worlds looked nothing like AC. Equally I had to point out the millions of pounds and person years of effort that had gone into making things that stunning. Also I often had to point out that the narrative and story is the point in AC and that just because we have things that look like games they are not, they served a different purpose. Anyway, here we at at AC III, which has had more than 2 other games since the original but this is apparently the main plot line. It is interesting in that the first 45 mins or so is really a tutorial, a lead into the story before any starting titles. Just like a Bond film usually does. However you get so immersed in what you are doing, enjoying the visuals and the story that it is a shock when you are suddenly faced withe some starting titles so late in. I had also seen that we had a new character and time to exist in and explore. It was supposed to be a native american, a sort of outdoors hunting ninja style. So it was a little bit weird to spend the first 5 hours of the game as a completely different character. (yes 5 hours more of what is in effect a preamble). This had a plot point and one that I think worked, once you accept the time and effort you need to put in. Eventually though you are set free to roam the American Wilderness, free-running from tree to tree hunting animals. 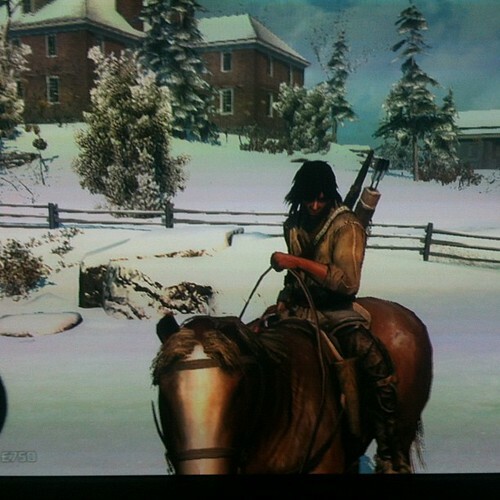 It gets very Red Dead Redemption though once you start riding around on horses. It is an interesting historical setting, attempting to blend with the American War of Independence. You meet the main protagonists in the uprising. I got to wander tunnels with Sam Adams and hunt papers for Benjamin Franklin. In Boston itself it is good to see all the original buildings like Fanueil Hall in place. It has a great atmosphere, just as the previous cities in previous games. I have seen that the main game is about 20 hours long, which does make me wonder why the first 6 hours have been spent doing the setup up for the next 14. I am sure the pace could have been sharpened a little. However, free roaming games have a certain feel to them where you are quite happy to not advance the story but just hang out. it might be driving in GTA listening to music, sitting playing cards in Read Dead Redemption etc. There seem plenty of self setting challenges in AC III too. The scalability of buildings, the need vast distances you are able to cover in the frontier that pull you away from playing it too quickly and missing something. It is with out doubt a great achievement in AAA development. In a world where small cartoon birds or fields of slow growing corn has been attracting all the attention we still do have room for blockbusters like this.